Alaska Northwest Books, 9780882406039, 64pp. Young readers love following this inquisitive eight-year-old and his trusty dog, Neptune, on misadventures that are full of fun, humor, suspense, and natural history, geography, and other lessons in life. This exciting series continues with Sam dreading the looming first day of school where he fears his annual back-to-school essay about his summer's activities will not be as impressive as the know-it-all Melody Chambers's. 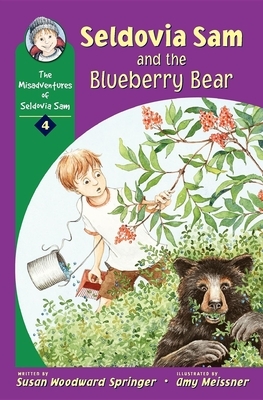 For an end-of-summer adventure, Sam goes blueberry picking with his mom and best friend, Billy. He learns the hard way about safety and respect for wildlife when he has a face-to-face encounter with a bear cub, its protective mom close behind. Heroic Neptune saves the day as she protects her masters after they are chased back into their truck. Find out if this exciting turn of events will make Sam's essay a grand prize winner. Susan Woodward Springer, an artist and writer currently lives in Boulder, Colorado.Amy Meissner completed her undergraduate degrees in art and textiles in Nevada and spent several years as a clothing designer in the United States and Canada. Amy received a Master of Fine Arts in Creative Writing at the University of Alaska Anchorage, while focusing on her artwork in her spare time. Besides her existing illustrations in the expanding series entitled, The Misadventures of Seldovia Sam, she has illustrated three other children's books. Amy Meissner currently lives and works in Anchorage, Alaska. Her two, bad orange cats keep her company in the studio all day long where she paints, draws, writes, cuts fabric, and moves cats off the things they aren't supposed to sleep on.